The library has an extensive collection of sixteenth through twentieth century maps and atlases. The corpus of the collection is the result of generous gifts from four benefactors: Rucker Agee, Joseph H. Woodward II, John C. Henley III, and Dr. Charles W. Ochs. A project is underway to organize, inventory, and catalog the collection. 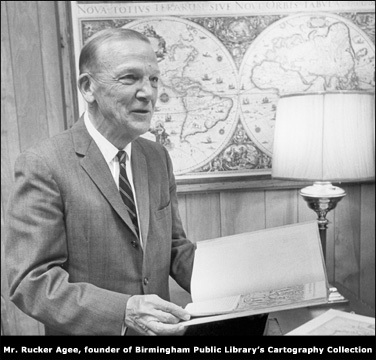 The maps are housed in the Rucker Agee Room adjacent to the Southern History Department. Access to the printed maps is closed during this project. Some digital images are available. The Department of Geography at the University of Alabama digitized over 900 of the Birmingham Public Library's rare maps. These images are a part of the Birmingham Public Library Digital Collections and are also found on the website of the University of Alabama. 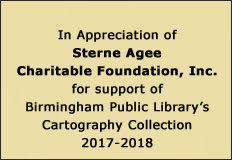 The cartography collection was established in 1964 when Mr. Agee gave his private collection to the Birmingham Public Library. The collection was enhanced with generous gifts from Mr. Woodward, Mr. Henley, and Dr. Ochs. The focus of the map collection is on the historical development of cartography and the geography of the Southeastern states in particular. The collection comprises over four thousand maps from the sixteenth century forward and includes historical books, atlases, gazetteers, and the works of notable authors including Ptolemy, Mela, and Strabo. Later works are represented by Theodore de Bry, the authors of the De Soto narratives, and the twenty-two volume set of Provost d’Exile. The prize atlas of this special collection, as it would be in almost any other, is the first edition and royal edition of the Atlas Maior published by Johann Blaeu in 1662.